In London, the district of Shoreditch belongs to the hipsters. Jeans can never be too tight. Hair should never be brushed. Coffee is black. Bagel is spelled “beigel.” The Light Bar straddles the border between Shoreditch and London’s Financial District, resulting in a pleasant mix. Think “suits and sweater-vests” meets “fun and funky.” Light Bar has a patio and a roof deck, too, which are a must for warm summer nights in London. On one such summer night, a Dutchman, Canadian and American set out to test the nacho-mettle of the Light Bar. The nachos arrived fresh from the kitchen. Our Canadian critic promptly burned herself on the plate. We were initially skeptical due to the lack of meat or beans, but ample cheese, salsa, sour cream, jalapenos and guacamole made up for it. Quality of toppings: (7) The guacamole was one of the best we’ve tasted anywhere in London. The cheese had a nice kick—probably some sort of “mature aged” British variety. The American felt the chips were slightly overcooked, but the Dutchman and Canadian liked the crunchiness. The sour cream and salsa were nothing to blog about. Price: (7) 6.50 GBP / $10.55 USD. Not great, but for London this was good deal. The plate easily fed all three of us. So, we’ve got an new #1 nacho destination in London. 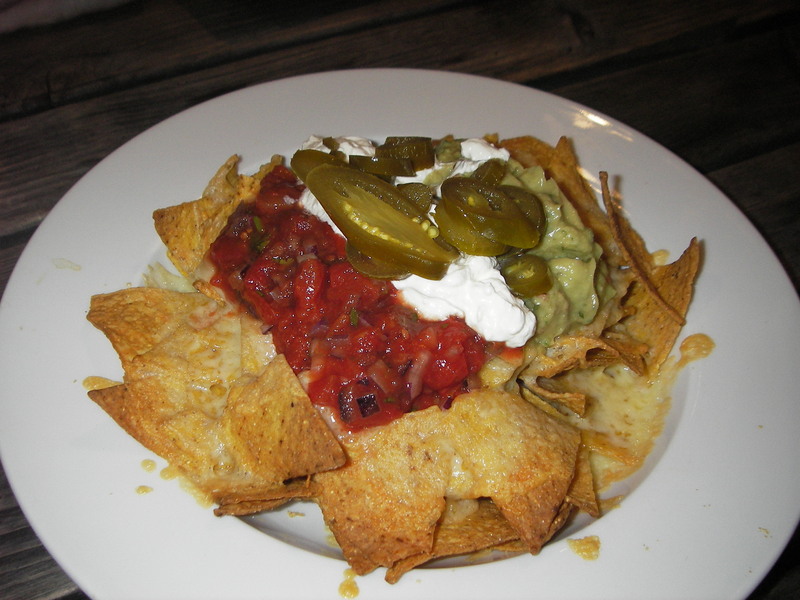 (Or, it might be more accurate to say that we finally have a nacho destination in London.) Cheerio. And nacho.